What Are Diminished 7 Arpeggios? Diminished 7 arpeggios are built with seven notes. They can be considered as diminished triads with a diminished seventh. The interval formula is Root (R), minor third (b3), diminished fifth (b5), diminished seventh (bb7). They are basically used to play over diminished 7 chords and dominant b9 chords as explained below. How to Use Diminished 7 Arpeggios? The basic application of diminished 7th arpeggios is to play them over diminished 7th chords because they have the same notes. For example, playing a G°7 arpeggio over a G°7 chord. However, dim7 chords are rarely used. 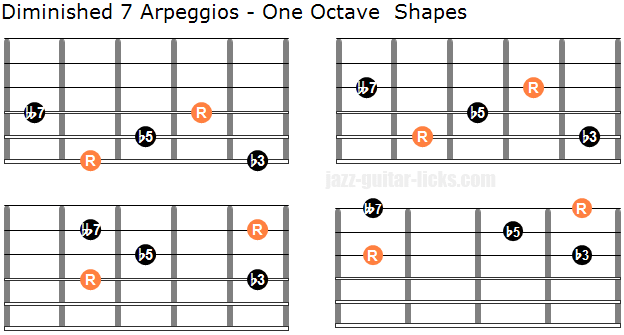 One of the most common application of dim7 arpeggios is to play them over dominant b9 chords. Indeed, the notes of a diminished 7th arpeggio are identical to the notes of a dominant b9 chord a semitone lower. G7b9 chord is built with : G (root) - B (third) - D (fifth) - F (minor seventh) - Ab (flat ninth). Ab diminished 7th arpeggio is made up of : Ab (Root) - B (minor third) - D (diminished fifth) - F (diminished seventh). A diminished 7th arpeggio is built with minor third intervals, it is symmetrical. A minor third interval is made up of 3 semitones (3 frets on a guitar). It means that you can move any diminished 7th arpeggio positions up or down three frets and you will still find the same notes. Ab diminished 7th arpeggio (from the b9 of G7b9). B diminished 7th arpeggio (from the 3rd). D diminished 7th arpeggio (from the 5th). F diminished 7th arpeggio (from the b7). We find the diminished seventh arpeggios in diminished scales. These scales are the diminished scale and the dominant diminished scale. 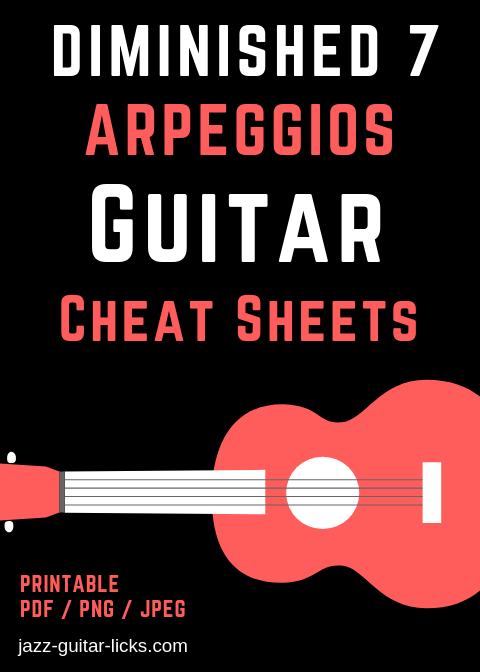 Here are four guitar diagrams that will help you to play diminished 7 arpeggios on guitar. The first shape has roots (R) on the sixht and fourth string. The second graphic has roots on the fifth and third string. The third diagrams has roots on the fourth and second string whereas the fourth shape has roots on the third and first string. It is advisable to play these shapes starting from the root notes, ascending and descending. Once you are comfortable with the fingerings, try to start from the other tones (b3, b5 and bb7). 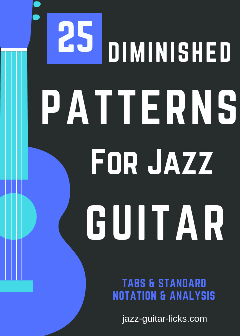 The next two shapes show you how the diminished 7 arpeggios looks like on the guitar fretboard within the space of two octaves. Don't hesitate to play the corresponding chord is a nice way to bring chords and arpeggios together. Here is a minor II-V-I sequence using a B diminished 7th arpeggio. This is a common chord progression very used in jazz music. In this line the B diminished arpeggio starts on the third of G7b9. Bar one : D descending Locrian mode (D-Eb-F-G-Ab-Bb-C) with a passing tone (A). Bar three : Fifth and b3 of Cm.